The tool uses an advanced machine learning system to detect click fraud, the repeated clicking of pay-per-click (PPC) ad performed only to generate revenue for the host and to charge the advertiser. Fruition, the Denver-based SEO and digital SEM agency that created the popular Fruition Google Penalty Checker tool, has launched in beta an advanced online tool that detects click fraud in online businesses’ pay-per-click advertising campaigns. The tool will be publicly available on or before Black Friday to help curb online theft from fraudulent clicks and orders during the popular shopping holiday. Fruition is now allowing users to sign up for early access via email registration. The tool uses an advanced machine learning system to detect click fraud, the repeated clicking of pay-per-click (PPC) ad performed only to generate revenue for the host and to charge the advertiser. Click fraud can be executed in many ways, such as crowdsourcing, which simply attempts to convince users to click on an ad via encouraging text; incentivized traffic, another method to persuade clicking via rewards like discount codes; hit inflation attacks, which redirect users automatically to ads; click farms, in which people are paid to click on ads; and botnets, malware that infects computers to control clicking. Some of these methods are easy to discover, but these days sophisticated bots and networks have made click fraud increasingly difficult to discover. Fruition’s new tool, however, has the capability to detect even the cleverest of click fraud techniques. In fact, Fruition’s click fraud tool has helped cut down on other increasingly worrisome security issues on websites. Results from Fruition’s paid search management team show that for some campaigns, click fraud accounts for nearly 60% of all clicks. Industries that are lead-generation based or that have a large affiliate presence represent the higher end of fraud, hurting their business through wrongly lost revenue. Early access sign-up is available on a limited basis. 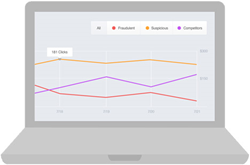 Pricing for Fruition’s click fraud tool is based on paid search volume. Fruition is a Denver, Colorado-based Internet services company that specializes in enterprise website development, SEM and SEO. The company also provides website hosting and security services for websites, apps and overall IT infrastructure. Its clients range in industries such as government entities, health care, finance and retail.